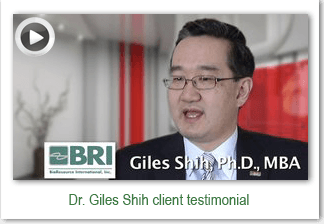 Bio Resource International Dr. Giles Shih Video. We appreciate the role that Scale Finance has played in launching and building our company. The Scale Finance team has been exceptional – tight reporting, always timely, and extraordinarily efficient with your time. And 80% of the time I have the opposite reaction to professional services providers and time requirements. Thank you! Dr. Michael Rosenberg, Founder & CEO, Health Decisions, Inc.
We have leveraged Scale Finance’s flexible, low cost, but highly responsive and professional support on three separate projects over the years. Unbeatable corporate finance support in the realm of part-time Controller, analytical projects, and specialized transactional advisory work. SF has served us well as a trusted finance partner as we’ve continued to grow our company rapidly. Scale Finance helped us navigate through a sensitive, challenging, and very strategic transaction process to achieve a terrific end result for Quaero. They helped us manage complex, delicate issues at critical moments in the process. We’re thrilled with the value they added especially given the reasonable fees of their unique model. Scale Finance provided quick, on-site support during a sensitive time for our Company. We really appreciated their huge impact in managing an in-depth and comprehensive financial due diligence process linked to a strategic transaction for our business. Their cost-effective problem-solving and savvy transactional advice was key to getting our deal done during tough economic conditions. It could not have been done without the Scale team. We needed equity capital to support our extremely fast growth. Scale Finance’s Dave Gilroy provided essential support in managing our growth capital raise during challenging times in the financial markets. Without Scale Finance, this would not have happened. On the basis of a bullet-proof balance sheet, we are now building out our unique model as a national leader in the sleep industry. I’m happy to be a reference for Scale Finance as there are not enough good things I can say about you and your company. Bret Plate, CEO and Susan Soja, COO, Kid Basix, Inc.
Raising funds in any economic climate is extremely challenging; as a young company in the retail space, we knew this would not be easy”. “We closed our first round of financing within 30 days of launch, and completed this one in a similar time frame. That’s not only a tribute to our strong shareholder base, but to having all aspects of the process managed by a highly experienced team. Scale Finance’s model of providing fractional CFO services, as well as transactional support, provides the complete solution for growing companies which need both financial expertise and financing to expand the business. We are now well-positioned for bringing our new products to market. Scale Finance’s Gary Hayes, fully integrated into our team as our part-time CFO. It was “part-time” in name only, because Gary was truly one of us. Few organizations provide the type of service and commitment that Scale Finance can provide!”The work that Gary Hayes and David Gilroy did for PrepChamps was simply amazing! Few people are as connected in venture capital as David and his team. As any entrepreneur knows, fund-raising is extremely challenging. David and his team helped us close our $1.8 million Series A round, they introduced us to well over 50 relevant VCs across the country, and we presented to 25+ VCs while we strived to raise a $5 million Series B. If you need a true partner to help you get to the next level, the Scale Finance team is the answer. Scale Finance and Dave Gilroy provided solid financial management support for more than a year during a critical time for our Company. He was particularly helpful in canvassing the venture investment community in a creative, systematic, and well-managed way to ensure that our Company received the growth financing we needed. The proof was ultimately in a highly successful outcome—a closed deal for 7-figures in new cash equity financing from a great partner/investor who will add a lot of value to what we’re building. Gary Hayes has been providing F-Origin part time CFO services since April, 2007. Gary has been very effective in getting the books of the company in a position to go through an extensive review by our outside auditors with minimal changes. In addition they have been very useful in establishing a monthly reporting package for the Board, develop and update our budget and establish basic operating procedures for an early stage company. Over the past 6 months we have been actively engaged in seeking a Series C round of financing and recently successfully closed $5M in new funding. Dave Gilroy played a significant role in support of the transaction to include due diligence analysis support, term sheet analysis, and advice on valuation. Gary and Dave continue to handle the financial management role as it relates to the Board, investors and our external banking partner. We considered the full range of options. We needed to tighten up our monthly closing process, fully leverage our accounting systems and document our processes and procedures. The professionals now at Scale Finance clearly provided the best combination of hands-on expertise, affordability and variable cost flexibility. Ken Wright, a Scale Finance Senior Controller, blended seamlessly into our culture and delivered on his commitment. Scale Finance professionals have had an extraordinary impact on our business in a very short time. We are a growing healthcare software company, and faced a mission-critical need last year to scale our financial capabilities as the company’s growth accelerates. Without a doubt, the effectiveness and economics of shared-resource, fractional-use Senior Controller support was the right answer for our company. We have better, more strategic financial leadership than we would require, or could afford, on a full-time basis, and the impact has been terrific. Essentially, key financial management activities are far better handled by Scale Finance professionals than we were able to manage internally, and at lower cost. This has allowed us to focus on new customer acquisition and support—so critical during th period of growth as were are experiencing right now. We are invested a number of fast growing businesses in wireless communications and need reliable and cost-effective accounting support. Flexibility is also key as our requirements are on-demand, distributed geographically, and need to dial up or dial down as situations at various companies develop. Time is our most valuable resource, and Scale Finance adds real value through a convenient single-stop solution. We have found their professional resources to be high impact and well-suited at very reasonable cost. Steve McPhail, President & CEO, Expression Analysis, Inc. Scale Finance has provided Expression Analysis with solid Controller support since the end of 2007. They have been very effective in getting the company through a formal outside audit, organizing financial infrastructure to scale our business, and getting our monthly reporting package including a forecast update for our board done on a timely and accurate basis. Over the past several months Gary and Bonnie have been supporting our migration to a more sophisticated accounting system. In addition they have provided very effective training of our internal staff to allow them to assume a greater role in the overall accounting function. We have been using the part-time CFO Services of Gary Hayes since February 2007. Gary has been instrumental in facilitating our growth from a two-person company to one with eleven employees in just 15 months. Gary has developed and implemented a budgeting and forecasting methodology as well as a tool-set for managing the company’s finances on a monthly basis. The tool-set provides us an up-to-date assessment of our current and expected full year results which has helped us identify risks, effectively manage cash, and maximize the company’s tax position on an ongoing basis. Gary’s services and tool-set helped us through a seamless transition to a new banking partner, which has been critical to the company by providing new growth capital when needed. The market opportunity to serve small, but high growth companies in a tailored way that works economically on both sides is one that few firms are currently addressing. Scale Finance offers a unique blend of corporate finance services for these companies that will fit closely with client needs in the segment. Dave Gilroy has shown real passion and a high level of skills and experience in serving young growth companies over the last several years, and we wish Scale Finance all the success in the world. We have been leveraging Ken Wright and Dave Gilroy for over two years and have deployed their cost-effective support in multiple areas including intense Controller-level projects and strategic/transactional advisory. Their support has been essential in positioning Hissho for rapid growth and helping us to scale our infrastructure—accounting systems, people, monthly closing process. We have also been impressed by their “hands-on” impact in other critical areas, e.g. support in considering growth capital options. Hissho is now moving to a whole new level of size and profitability, and professionals at Scale Finance have become a key partner in our success. As a fast-growing software firm with strong advisory support from our angel investors, we have important requirements around professional financial management, reporting, forecasting, and cash management. These objectives are balanced by the need to be extremely cost conscious as we continue to invest in product technology and sales & marketing infrastructure to scale the business. We knew we needed a strong CFO-type but we couldn’t afford to hire someone of that caliber full time. Scale Finance provided us with an extremely experienced and operationally savvy Chief Financial Officer who ramped up incredibly quickly. Today, I don’t worry anymore about financial reporting, cash management and forecasting because it’s all done for me—all for cheaper than a typical bookkeeper. We use our CFO only as we need him, and I get to look at reports about the performance of our company on a weekly basis. And as our company’s needs grow, I can count on Scale Finance to scale with my business. As business owners, we all want to do it ourselves so we feel more in control. The problem is, that philosophy robs us of time we should be spending on other areas of the business which need it the most. If you are doing your own company’s financials, or worse yet – not doing them, ask yourself what that time could better be spent on. For us, it was better spent on growing the business by concentrating on sales and marketing instead of putting together late night Excel spreadsheets. As a closely-held, extremely private company, we leverage outside professional resources only very selectively. Our fast growth in recent years has required us to step-up the level of internal systems, infrastructure, and skills in key areas of finance and accounting. Dave Gilroy and Matt Ocenas provided a compelling, cost-effective solution to impact and improve these critical areas of our company decisively. In addition, senior Scale Finance professionals have provided highly useful strategic and operational planning advice and support in a challenging, thought-provoking, but also non-threatening way.